I told her slaw is one of those things I don’t really have a recipe for. I just start whisking things together and keep adding more shredded cabbage and carrots until it looks about right. “Cider vinegar?! ?” She said. “I don’t know from cider vinegar. As soon as I see it in a recipe I’m turning the page.” Kate is a psychologist, but she has also has a side career as a Second City comedian, so sometimes it can be hard to tell when she’s kidding. I started laughing until I realized that in our house, we totally have our own list of page turners — puff pastry, marjoram, anything deep-fried — and they’re all equally ridiculous. Marjoram is probably right next to mustard powder on the spice shelf, but whenever I see it in a recipe I assume the dish was meant for someone with exotic taste who knows exactly how to use it. Puff pastry, with all its layering and covering with wet towels, is just downright terrifying to someone for whom patience has never been a strong suit (or any suit at all, actually). And deep frying? Doesn’t that involve a special thermometer or something? I think the ingredient with the world’s longest reign as premiere page-turner in my life is “yeast.” (Is there anything more alienating for a new parent than the phrase “Allow dough to rise 8 hours?”) But then Jim Lahey and his no-knead bread revolution came along (luckily right about the time the girls were old enough to allow for me to build “rise time” into my day) and one day in the supermarket I just did it. I picked up the Fleischmann’s Active Dry stuff and tried the famous bread recipe. Amazingly, it worked! Just like it had for the other 1 billion people in the world who had grabbed the yeast packets in their supermarkets and tried it before me. So, Kate, the cider vinegar revolution starts today! Right here, right now with this not-even-a-little-bit-fancy dinner sandwich. And I’m declaring it Get Over Your Page Turner Ingredient Day for the rest of us, too, so if anyone has any good recipes that call for puff pastry, I’m all ears. 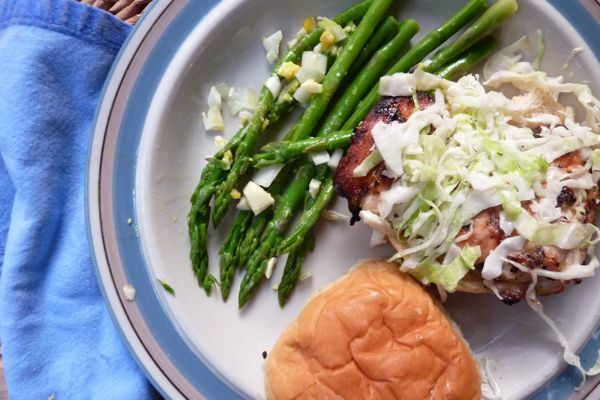 Make our grilled chicken for people who hate grilled chicken and assemble sandwiches with whole wheat hamburger buns or potato rolls, then top with…. In a large bowl, whisk together 1/3 cup cider vinegar, 1 teaspoon prepared horseradish, 4 heaping tablespoons mayonnaise, ½ teaspoon celery seed, 1 tablespoon sugar, salt and pepper to taste. Set aside. Shred half a head of green cabbage (5 cups) as thinly as possible. (With a mandoline or the shredding disk of a food processor.) Add to the dressing and toss to combine. Serve right away. Thanks for this slaw recipe! My page-turner ingredient is celery seed. Time to go to the store, because this sandwich looks delicious. My page turner: Cornstarch. I can’t really explain why either. When I see “cornstarch” on an ingredients list, I pretty much discount that recipe. Also on my list, vanilla bean and fresh nutmeg. Seriously? Who ever has such things around the house? And I share your fear of puff pastry. Have you ever tried the mini phyllo shells they sell in the freezer section? They have the same swanky effect and are a lot easier to use. Please, please give it a shot. You’ll be converted. my pageturner is anything that requires a candy thermometer…or hard-ball/soft-ball stage. eek! deep frying too, but that’s more a healthy thing – I eat enough fried foods in resturants that I don’t want to get into it at home! My two page turners – anything with olives, and anything deep fried. Aside from the health issues, I never know what to do with all that oil once you’re done. I know you’re supposed to be able to strain it and reuse it or something like that, but it’s a lot easier to turn the page. As far as olives, I’m really not that picky of an eater, but it’s hard to believe that they are really considered edible. The other Meg and I not only share a name, but a page turner philosophy! I am also terrified of the whole “soft ball stage”, candy thermometer thing. Here’s what you do: They sell it in the freezer section. You take it home, let it thaw for like an hour, cut it into squares, add filling, brush with egg and bake, and voila! Fancy-looking pastries with half an hour’s work. No wet towels or rolling pins involved. I personally fill it with prune filling for Christmas (traditional Finnish recipe) and with apples for turnovers in the summer and fall. Yummy and easy! See this link for pictures of the Finnish Christmas pinwheel pastries: http://www.saunalahti.fi/~marian1/gourmet/xmas9.htm Ignore the text – you’re not making either the dough or the filling at home since both are available in store – but the pictures show how to shape the pinwheels. “Yeast” and any fancy thermometer (I’m looking at you “hard ball stage”) are my two biggest page turners. Also not a big fan of homemade pie crusts. But I’m turning it into a culinary bucket list for myself and deciding to make a list of all the things that scare me/turn me off a recipe and conquering them one by one. Page turners: Creaming butter. (How do you know when it’s creamed?!) Chopping chocolate– that seems entirely too messy and time consuming. Come to think of it…I’m pretty scared of baking in general. I agree with Meg on the FISH sauce. Cringe. fennel or caraway seeds. star anise too. Sesame oil is a big page turner for me, but mostly because I don’t care for it. Also, 3 recipes I have read in the past week included kaffir lime leaves……definite page turner, as there is no way I will find them here. This will help you get over your fear of puff pastry. Barefoot Contessa to the rescue again! Make it and you will be a hit at any brunch you go to. BC never disappoints – seriously, have you tried the lentil vegetable stew yet? Get on that! My page turner is fennel seeds. I see those listed in a recipe (like your pork ragu which we made this weekend sans seeds) and I say to myself, “Who needs those seeds? Skip it!” I can never crush those little seeds of hate and furthermore I can’t taste them. I need to try them now that you have plenty of puff pastry recipes in your arsenal. the no knead recipe totally changed my view of yeast as well! If I have to use a blender or a food processor, I turn the page. I hate digging these appliances out from behind everything that I use more regularly and I HATE cleaning them! Have I mentioned lately how much I LOVE THIS SITE??? tarragon does it for me! Interesting post and comments. Agree with candy thermometer being a page turner because I don’t own one (yet). Yeast was a page turner until this past year, when I finally got the hang of homemade pizza and discovered Artisan Bread in 5 Minutes. Cornstarch and sesame oil are nearly daily staples in our household (I’m Asian) – funny to think that they’re page turners in other households! Agree that Pepperidge Farm Puff Pastry is wonderful and so easy to use. Other page turners for me: Gorgonzola, lima beans, springform pan (never replaced my old one), any recipe with >1-1/2 sticks of butter. “Deep fried” fo’ sho’! Also, ice box cookies. I like to make dough and roll from there! Would you believe its dried beans. As in soaking them overnight and all that. Crazy, since it’s the simplest thing in the world to do! As it happens I’m conquering my fear today (even before I read this!) Black beans and turkey chili for dinner.. So funny! Thanks for documenting this – and nice to see that I’m not the only one who turns the page at yeast, candy thermometer and deep fried. My husband and I were just discussing this … I was looking for a Cinco de Mayo friendly dessert and he was reading aloud about chocolate pralines and said, Woops, better turn the page! i read in a Mark Bittman column a few years ago that his page turner is “bain marie” and i totally agree. also: any recipe that requires more yolks than whites or vice versa (nothing grosser than a clump of four yolks in a mini Pyrex sitting in the refrigerator, waiting for that “some day” use). agree about the marjoram: have used it a grand total of once, in a NYT thanksgiving sweet potato recipe, and it was so marjorammy that no one ate it. the sweet potatoes–and no one wanted them! It used to be sectioning citrus fruit. But since my 17-month-old daughter decided she wouldn’t eat oranges unless they were membrane-free, I’ve sectioned more oranges than the salad chef at Chez Panisse. Now it’s any recipe that has more than about 5 ingredients. HILARIOUS! My “page turner” is also deep-frying. The idea of the massive clean-up of old oil and spattered stove top & counters puts me off completely. I know I could do it, I just don’t want to bother. yeast? no problem. I make almost all of our bread from scratch these days (gotta love that No-Knead business!) Puff Pastry- break it out every once in a while (love Pepperidge Farms!) while marjoram isn’t a page turner… just rarely used. Cider Vinegar though? I wouldn’t even blink- it’s a staple at our house. Ginger juice and fennel pollen. Both are recipe killers for me. Like so many others, deep frying is a deal breaker for me, and I wholeheartedly agree with what 654Caroll tells us is Mark Bittman’s page-turner: bain marie. I just refuse to do it—I make the recipe and melt or cook whatever needs melting or cooking without the damn bain maire! But frozen puff pastry is really fun: turn the page back! I stew apples with cinnamon and sugar, fold in the middle of a square of pastry, and make (not very good for you but delicious and easy) apple turnovers. But I’ve got to call you out on the puff pastry front: A-MAZ-ING!!! Make this: http://www.bonappetit.com/recipes/2008/11/chaussons_aux_pommes (from Molly Weizenberg), but fix a few things: just make 9 instead of saving some of the dough for something else, and use an awesome chunky apple or peach sauce if you’re short on time (though the filling listed is delicious). This is one of our all time favorite breakfasts. Cream of tartar is what makes Snickerdoodles stay soft and delicious! My page turner any recipe that has ingredients that I would have to go to a specialty store to purchase! I don’t do phyllo dough (because of the towel, multilayer thing), but I use *gasp* frozen puff pastry sheets and they are super easy. My page turner is anything that involves whole seeds and crushing mortar & pestle style. Fennel seeds, cumin seeds, etc. Seriously, what could be easier than frozen puff pastry? I mean, I am not ever making baklava ever again, but stick a tube of marzipan down the middle, brush with egg, top with sugar and almonds and BAKE IT! So easy. Children beg for this. Puff Pastry? You will probably want to check out anything puff pastry-y with Julia Child. That woman knows her buttery deliciousness. ESPECIALLY if you are essentially making puff pastry for her tarte tatine. Just the other day I saw a recipe for napoleons in which you put puff pastry squares in your panini maker for about 3-4 minutes. I haven’t tried it yet, but I will! These are all so funny. And re: puff pastry. No one ever said these fears were rational. I’m sure using it is as easy as adding cider vinegar to cole slaw. Thanks for the encouragement — I’ll keep you posted!! Hysterical! I actually keep a list of cooking goals in order to get over my page turners – and I haven’t ever done one of them yet!! And I’m idiosyncratic – I’ll use a candy thermometer but, “wipe down the sides of a pan with a wet pastry brush” – no way! I’m definitely terrified of baking bread; deep-frying anything; decorating a cake with anything more elaborate than a big schmear of frosting; and any recipe that uses the word “scant” in it. PS I realize you don’t have kids with food allergies, Jenny, but over here with use your site & your Time for Dinner book often — other than egg-based stuff, which is hard for me to figure out how to cook around, there’s a lot my dairy, egg, & nut allergic kid can eat out of there. This is really funny. I also don’t love puff pastry but have attempted it (with the frozen stuff) a few times. I find it hard to work with. My page turners usually involve equipment I don’t have and don’t want to get involved with – like slow cookers, pressure cookers, and especially candy thermometers. I used to be afraid of yeast also, until I became a mom trying to occupy a toddler all day. One day I decided we were going to make our own soft pretzels. I watched Alton Brown do it (research) and we gave it a try. It was not that hard and they turned out great, so I’m no longer afraid of those silly little packets! I can’t wait to try this. I love cider vinegar. LOL. I love this topic. I’m sure I have one but I cannot think of it at the moment. Everything you have mentioned I have in my kitchen but I’m sure it’s out there. Jesser, re: phyllo v. puff pastry, I wouldn’t know, as phyllo also qualifies as a page-turner for me. But, yes, it’s very possible that I am confusing them based on the reactions of my passionate puff-pastry using readership. Thank you for the Moosewood rec. Sounds delicious. I know it sounds nuts, but anything involving a food processor. We own one… but it’s a pain to get it out and use and then clean it. So generally… I just turn the page. love this question and your confession of your page turners. Mine are anything involving lentils. The red ones are ok, but I have a hard time getting into anything that looks (and tastes) that close to dirt. My apologies to lentil lovers everywhere, maybe I just need a better recipe. Page turners include mango chutney (even though I like it, I just don’t want to have half a jar sitting around waiting for the next recipe), cake flour (again, storing something that gets only occasional use) and extra-large eggs (which pretty much eliminates every dessert recipe ever created by Ina Garten). Anything that requires special instruments. Being a college student, I turn the page on recipes that make me feel like I need a license and a lab to make something good. What a great topic! I read this last night and waited to answer because I wanted to think about it – no single ingredient jumped out at me as my page turner. I pretty much will try it all I guess. In general though I typically find myself avoiding mayo – or at least reducing it significantly in a recipe…I’ll keep thinking…! What an awesome topic–especially because I am the cider vinegar-phobic friend who inspired the column! Thank you, Jenny for outing me! And, btw, corn starch too!!! 1. Fill a pot with vegetable oil tall enough to cover whatever you’re frying plus a little. 2. Heat to medium high, and you’ll know the oil is ready when you put a wooden spoon in the oil and bubbles semi-rapidly come off the spoon. 3. The batter is simple: flour + enough wheat beer to make a pancake batter consistency and a dash of salt. 4. Then just fry until you reach desired darkness, when frying small items it should take no longer than 3 minutes for small items (like my favorites, below) but if it darkens in a minute, the oil is too hot. Wait to heat up or take off heat accordingly and start again. It is a delicious batter–my favorite things to fry are onions, bananas and avocados. Enjoy! This is funny. I have just been grappling with my page-turner, yeast, as well. I never make anything with yeast…but it seems like it would be so much more economical to bake my own bread than to buy it all the time. And wouldn’t like to be able to make carmel pecan rolls from scratch? But how to start…I haven’t brought myself to it yet. But seriously, marjoram? Exotic? I would never have expected it from you. Most of my page-turners involve a food allergy by at least one of us…tree nuts, eggs, celery (yes, celery), blue cheese. I’ll try pretty much anything else, but one irrational page turner for me is anything that has “casserole” in its name. I just immediately think, “Too much work for something that is inevitably overcooked.” Which is, of course, a ridiculous attitude to have since most casseroles take less hands-on time than many stove-top meals I make. Maybe my problem is that I am always attracted to recipes for super-involved, dirty-four-pots-before-it’s-even-in-the-oven type of casserole. Haha. Pam, I totally feel you on casseroles. Ick! Technique: deep fried, bain-marie, and anything where the vegetables have to be prepared separately (precious ratatouille recipes, for example). I recently got over my fear of dill and realize I really like the stuff. So I urge fish sauce-phobes –to give it a try, it adds so much flavor, keeps forever, and is essentail to giving Thai and Vietnamese recipes that pop. My page-turner? Asian foods – “stir-fry” and fish sauce make me flip. And any sort of fish – I hate seafood (except soft-shelled crab and anchovies). 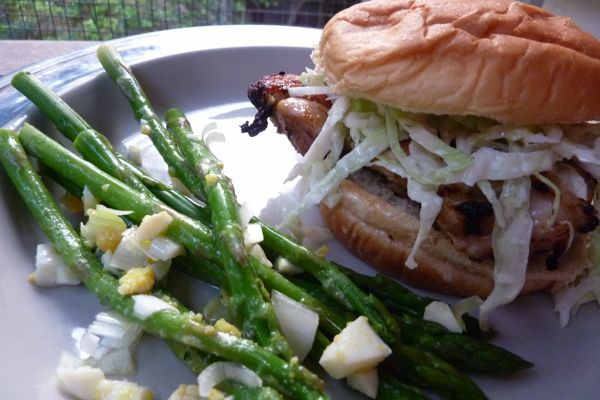 The slaw atop a chicken breast is great! I’m used to it over pulled pork but I’ve not tried with chicken. Yum! jenny-since i’m late to this post and did not read all 8,000 comments so maybe someone said this already but store bought Puff is a great way to eek out another dinner from leftover roast chicken- in a pot pie. omg- i feel like such a housewife saying this.. but make a roux (sp?) add chicken stock- pieces of the chicken-carrots- my fav part- frozen pearl onions… kind of the best thing ever. absolutely yeast. when a recipe tells you to mix it into warm water and then gives you a temperature range for the water that’s about a 5 degree range, how are you supposed to measure that? With a candy thermometer? who does this? oh, kafir lime leaves and anything that asks me to grind spices too. My page turner would probably have to be deep frying anything. Or fish. For some reason, I am really terrified of cooking fish. But I have to say, that you are afraid of the wrong page turner! Puff pastry is pre-made flaky dough that you just wrap around things.It would not dry out without a towel over it unless left out for much longer than it would take to prepare anything that calls for puff pastry. Take a whole round brie, spread honey-mustard or thick jam over the top, wrap a thawed puff pastry sheet around it (with the flat part on top and the rest folded underneath) and bake. GREAT PARTY FOOD-NO WORK! It’s great with a good bread or with crackers. You are actually afraid of phyllo dough, which I love but it is scary because it dries and crumbles in seconds if left without that damp towel on it!